The journey gives disabled pilgrims a rare opportunity to take a religious vacation. 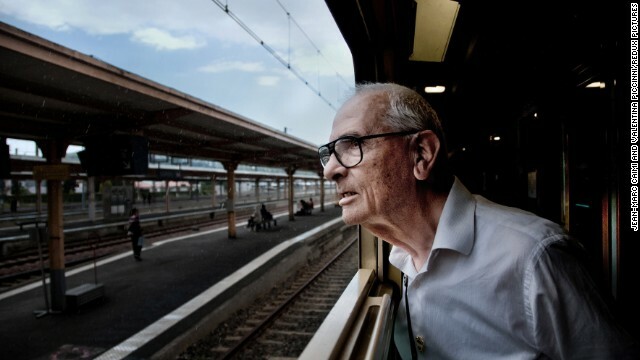 Photographers Jean-Marc Caimi and Valentina Piccinni rode with 600 pilgrims and volunteers as they took the “white train” from Reggio Calabria in southern Italy to the French town of Lourdes. Disabled believers make the journey annually in hopes of a miracle. « Previous entryGranderson: A boy named 'Messiah'? ELECTRONIC HARASSMENT CRITICAL SITUATION VENEZUELA. Why do you think that we publish this be cause the agencies are cauterizing your epiglottis glottis and trachea. WITH NANOTECHNOLOGY, DOCTORS ITS NOT A BACTERIA OR VIRUS PROOVED. CNN DO YOU KNOW A AGENT SERIAL KILLER FROM AGENCIES, THE DAMAGE SUBJETS FROM SATELITE. IN VENEZUELA ARE FROM THE HILLS IN CARACAS OR BARRIOS. Hot topic: The Spain King giving budget to built and University of Carabobo in Spain with the same name to the Venezuela University. Prayers can't change muxxlim terrorists. As others have noted, both the Quran and the standard Islamic prayers use a lot of repetition. The praying also requires homogeneous, repetitive actions by a group. This works to dull the senses even further of the people gullible enough to fall for the religion to begin with, and make them even more compliant and malleable to the leaders. Common technique with other religions, but in Islam with its other proclivities to violence and murder and its glorification of "martyrs" who do its horrific deeds to nonbelievers, it's particularly sinister, and we know how awful the results can be. Now here you can see that Islam has mzh totally sucked in, to the point of trying to pull others into the downward spiral of his cult. Brake and avoid. Next time try responding directly to the post content instead of trying yet another sales job on us of your religion of terror. This is on par with the idiot Muslim hoardes making their pilgrammages to Mecca. The only value that comes out of either is what funds profiteers can extract from them enroute. Meccas....Sorta like the Marine Corp wall in DC, or visits to Civil War battle Fields? Heck, maybe you can even add Bikers week in Daytona. Quite the false analogies there. Woo hoo. Quite the Woo there, hoo. Your claimed message of peace rings completely hollow when we look at what followers of your religion are instructed to do to "infidels". Nice try at sugarcoating your religion of violence, anyway. Still the same old poison pill inside. Don't you think if this is the case then there should not be a single Non-Muslim around the earth in last 14+ hundreds of years as you say the infidel should be killed? If you wanna live in incorrect understanding world, go right ahead... its your choice that you are making... no one is forcing you... aren't you also living in an delusion with due respect? Your latest post is utter nonsense, since, among other reasons, it assumes that none of the infidels would fight back. And speaking of "incorrect understanding of the world", do look in the mirror. Your frequently erroneous and illogical posts just get tiresome. As for due respect, ideas do not deserve respect. They are not people. Ideas should be critically examined, and your ideas do not hold up under examination. Try to gain some understanding of that before you post more nonsense about your religion of violence AKA Islam, and before you go on with your insulting (and laughable) claims that others are deluded. Again, your remonstrations about "peace" just ring hollow when we look at what followers of your religion are instructed to do to "infidels". Nice try at sugarcoating your religion of violence, anyway. Still the same old poison pill inside. Question. Since all Muslims are not violent, are we to judge the whole as a group or are we to judge each as an individual? Seems a bit of a tangent there mark. Earlier posts are more looking at the religion's book says should be done, I thunk. The "instruction manual" thing, not the flock members vs, the frock. You grok? Question: can I have some attention please please?
" Soon you will find Muslim in your own family...."
mzh, If someone who believed the earth is flat were to join my family it would make that belief no more true. If someone who held nazi beliefs were to join my familyy, it would make those beliefs no more morally sound. Islam is holding back the economies of multiple countries through promotion of poor economic practices, high fertility rates, and beliefs that lead to violence and instability. Unless Islam changes radically it will remain the case that only those Islamic countries actually sitting on oil fields will have the chance to temporaily flourish. There are versions of Islam that avoid these problems, and subtler variants like Bahai, but the futre for progress in these direction doesn't look good with the oppressive policies that Islamic states usually end up enforcing. Each country will continue to spiral in and out of oppression and violence and chaos until something changes. @ mzh ... sorry, but I choose NOT to folow a ped-o-phile who marries a NINE year old girl. Your prophet must be hung like a hamster, and it was heat exhaustion in the desert that gave him the "vision" of an angel (Gabriel). Any psychiatrist will tell you that if you see "angels", you are in dire need of therapy. "Soon you will find Muslim in your own family as lots of family are having now and in your friend circles as well..."
Somewhat like Catholics, Muslims are still struggling with modern medical developments like birth control. It's hard to handle, when you are stuck with a dark age mythology that didn't contemplate future advancements. more like "a fool and his money are soon parted" train. gullible sheep buying religious snake oil. Very sad that such a scam exists, and that it condoned by the leaders of a religion.